This post is one of several that went missing when we converted to the new site. We will be reinstating these as we come across them. An atmospheric shot of the ICI Agricultural Divison Offices in Billingham. We think this photograph was taken in the late 1960s. I worked as an apprentice electrical fitter in ICI from 1960 till I Left to go to the merchant navy in early 1966. I was born in Billingham in 1945 but brought up North of Newcastle when I came back to start work with ICI it took me 3 months to realize I was the foreigner and not the locals. In those days I had a very broad Geordie accent. I remember also the bowling alley in Billingham. In August 1966 I left England and only returned in 2016 and when I went back to Billingham I could not believe how the factory had changed. For me it was very sad from what I left in 1966 and saw in 2016. Did any of you know of a Ron Wilkinson? Very enjoyable trips into the past. ICI to me was a wonder factory where I spent many happy years as an apprentice. Glancing through the entries I noticed one from Bill Davies who worked as messenger boy at Oil Works offices from 1954 – 1955. Bill mentions that Mr T N Frankland was the Time Clerk at that time. When I was a messenger boy from 1961 to 1962 Mr Frankland was the Works Clerk. Is this an indication of Mr Frankland’s career path or is ‘Time Clerk’ an error? My uncle Raymond Birtle worked there for many years. Does anyone remember him? H.O.C. offices Billingham. Worked there as a messenger girl in the offices and then full time in the Printing Section. Had a happy time at school but working in that printing Section had never come up against such bullying behaviour as a teenager from married women in their 20s/30s who should have known better. To this day that behaviour affects me and I do not know why! I had my money stolen and not one of them offered a loan for my fare back to Middlesbrough! I am happy to say I am a person first to help anyone in need. Hang your heads in shame, you know who you are! This was me! I was then 16 I am now 60+ and I still cry recalling the cruelty. Please recognise the effects of bullying in the workplace. I am now an employer myself and treat my staff with the utmost respect and care. How awful for you when you were younger, I know the effects bullies can have on people, as I was also bullied when I was younger by older people. My father-in-law served his apprenticeship here as a plater and then worked post apprenticeship. He insists that as part of his wage he was paid with cigarettes. I am an ex Wilton apprentice and have never heard of this. Is there anyone out there that can verify this? I was wondering if anybody knew a JOHN MYERS who worked as clerk. I think in the 60’s. He would of been about 49 in 1969 was a widower had auburn hair about 5’5 medium build, ruddy complexion!! He may have also been attending a Theological college in his early forties. He had a married daughter then aged 22. If anyone knew him I would love to hear from you. My father William Eric Bibby, worked at ICI Billingham from 1940 to 1946 (approx) as an industrial chemist. He may have worked on the ‘tube alloys’ project related to the atomic bomb. I don’t know but occasional references were made which we children overheard. I was born 1946, my sister 1942 in Billingham, before we moved to Hull, where my Dad worked for DCL, eventually becoming BP. Does anyone know of my Dad or the work he was involved in? Of course he has now passed away, born 1911, died 1973. I am 17 years old and researching my family tree. I know my great uncle Thomas L Cooke (known as Leonard to his family) worked at ICI Billingham. I don’t know how long he worked there for, but in 1954 whilst working there, he was hit by a wagon on the tracks and died, aged 24. I was wondering if anyone knew him or witnessed what happened as I am very interested in find out more about him, and the man he was. I worked in ADO from 1971 – 1973, as a messenger in the Computer Room, all the ladies who worked there were lovely, Margaret, Hilda Smith, Kathy Hughes, Sandra & Gladys, can’t remember all their surnames! From there I went to Process Records in Old Process Office, we later moved into the New Process Offices, great job, five of us girls (Slyvia, Gloria Ibbetson, Val, & Julie Bateman, working over seven days per week, we each worked three weekends out of five, with days off during the week to compensate. Two years later I transferred back to ADO firstly working in Financial Records (names that I remember are Sue Symminton, Syd, Jackie O’Brien (my friend), Russel Wright, Stephen), and later in Cashiers, with John Good, (lovely man), Terry, Doreen and Ron Robson, (and Mr Benninton, the boss)! I left in 1980 to have a baby and moved to Australia in 1982 with my husband Steve who also worked at ICI. He started as a messenger the year before me in the drawing office in the Annex, then he went on to start his apprenticeship as a Pipefitter. I’d forgotten that Lousia McMurray had worked in the Post Room (she went to St Michaels at the same time as me), Carolyn Fullwood also worked there. There always seemed to be messengers coming and going as I’m sure there were six working in the Post Room at any one time. Tony Tacey (not sure if that’s how it’s spelt), was in charge. Anyone got any images of the elevator system? I remember seeing it on TV when I was very young. I worked at ADO in Billingham from 1976 to 1984 when I transferred to Wilton to take up a new post. I worked on the 4th floor in the ‘end office’ of Industral Products Department. There were many characters in the office including Bill Youdale, David Golightly and Ray Holmes. I have very fond memories of my time working in ADO and actually genuinely enjoyed my job! Something that is now rarely heard of. I like many others remember very well the pater noster lifts. I visited the site in October just before the demolition commenced and thought it was very sad. My late uncle, DAVE HUGHES, worked for ICI. I don’t know which plant he worked at, maybe someone out there will recall his name on reading this?? Sadly,like all my relations are no longer with us….apart…and I only found this out early last month(July), that his three sons, ALLEN, PETER and TONY are thankfully still kicking. My son and I spent 10 days in BROOMHILL,at THE TRAP INN, a very good base to work from plus a very good place to stay at. The basic reason for heading up to the N.E.,was to find my Grandfather,JAMES DUNCAN. He married my Gran, MARY JANE (nee CULLEN) in 1879 in THORNABY and they lived in No.40 GLADSTONE ST. STOCKTON. At some time before WW2 they moved to No.50 and my aunt Mary and hubby Dave Hughes took on the tenancy of No.40. Aunt Mary was Grans 6th. born child. Just this week, via Bereavement Services in Stockton, I had an item of post; a record of burial of 2 of her children, ALICE DUNCAN, aged 2yrs and ALLEN DOUGLAS DUNCAN aged 1 month. Alice died on 29 Dec 1914 and Allen on 10 Jan 1918. On the last day,on the way home to Gloucester, we found Grandad in Acklam Rd. cemetery, the 2 little ones are not far from their Dad. He passed in 1931….so I’m told. We are still waiting for searches to come back on Grandmar and the rest of her brood–only another 10 to find, then I too can rest in peace when my time comes in a year or so. Thanks for reading this…..Larry Duncan,almost 64. I used to work with a Dave Hughes at Visqueen at Stockton sometime in the late 70s to 1990, remember him as a big ginger haired guy. A great guy. I remember Dave Hughes at Visqueen too. Lots of interesting comments! Thank you. I used to work in the typing pool at North Tees Site in the mid to late 70’s, then I left in 1978 to emigrate to Canada with my husband Nev who also worked as a “Tiffy” at North Tees. Wondering if any of those employees are ever on here? Would love to hear from them. I worked with Hilary Sinclair (Gibbons) and Rita (Mead?). Some of the Engineers and Managers were Phil Ashworth, Paul Booth, Arthur Cass, Bill Pitt, etc. Pat Hunter was on switchboard. There was a lovely tea lady too, I forget her name. Canteen food was good too, us girls used to get a few wolfwhistles as we walked to the Canteen! Happy days. Hi Carole. I remember you from North Tees. I think I did your farewell presentation as you left for Canada. We’ve done our best to recreate the comments from the original site, see below…. The building shown here was ICI’s Agricultural Division Offices. The old Billingham Division of ICI split into Heavy Organic Chemicals Division and Agricultural Division in the 1960’s. 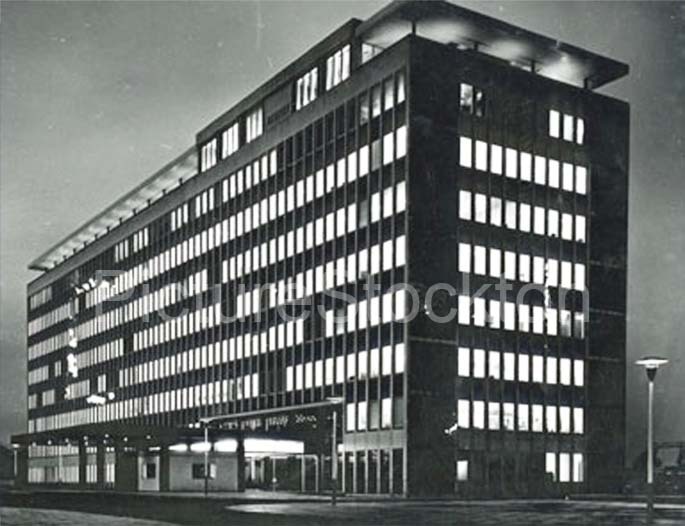 The camouflaged building adjoining the Billingham Works became Organic House and was too small to hold the HQ staffs of both Divisions so Agricultural Division built the new office block which is shown in a night view. I had the pleasure to work in this building which was known as ADO (Agricultural Division Offices) and then as Billingham House from 1982 to it’s close in 1992. Fond memories as a “messenger” and remembering the director’s top 7th floor as the only floor with carpeted corridors! Being in the post room at the rear of the building we looked out onto the car park which we christened the “toast rack”! The offices had a branch of Thomas Cook in the foyer a cashier’s office (complete with iron bars!) there were art exhibitions held in the foyer and “Ian” the local newsagent would be in the foyer selling newspapers every morning. I also remember the “paternosters” moving open lifts – not sure if they would meet HSE guidelines now! Working for ICI Fertilizers we were the last business to move from Billingham House and it was certainly a little “creepy” working in such a large building on our own. I went along to an ICI open day here it was great fun. It must have been in the early 90″s or very late 80″s. There was a tour of Visqueen at Stockton also home to the largest bubble – they make plastic bags. Such a shame to see the state of the building now compared to what it was like then. I remember my first visit to these offices in 1961 with some embarrassment. I was summoned to be interviewed in these offices prior to being admitted into the Drawing Office. Already nervous I was confronted for the first time by the Paternoster Lifts. Although I entered the moving lift cubicle without too much difficulty I was found lacking in expertise and timed my exit too late ending up in a heap on the floor after panicking and leaping for safety. Passing secretaries found my arrival hilarious and to cap that I was on the wrong floor. After dusting myself down I used the staircase to find my ultimate destination. Anybody with knowledge of these lifts will know how I felt. Fortunately I successfully negotiated the interviews and gave up my life as a Fitter on the Ammonia Works for a cushy job in the Products Works Drawing Office. I worked in the computer room here on the north end ground floor between 1981-1988 after which the section transferred to ICI Wilton. I remember the local children sneaking in after 5 pm to have a go on the paternoster lifts and the frenzied attempts of the commisionaire to remove them!!! I went to work in ICI in 1978 in Chilten House but went regularly over to headquarters. The paternoster lifts frigtened the living day lights out of me as I felt you stood in front of them rocking to and fro trying to time the opening and jump on. My Mam and Dad both worked for ICI as well. Mam originally on several of the gates giving out wages (the first women to do this down in the actually factory) and my dad as a driver. Mam eventually worked for the directors as a PA going to agricutural shows in this building I can still remember her extension number was 2291 after you got through the switchboard funny can’t remember my own. I on my return to Scotland went to work at ICI Ardeer it must be something in the Surtees nature to want to work for this company.It is sad to see these photos of what happened to this once huge building and rightly as one of the contributors to this site mentioned a very large employer of a lot of the people who lived in Billingham at the time. I worked at ICI Billingham from 1976 to 1980 first as a messenger in Chilton House then in ADO first in the Export Dept then and I worked in admin support. I don’t live in Billingham now and I was shocked to see ADO the mess that it is now it was such a grand building. Also to find that Chilton House is no longer standing, another grand building. As for the Paternosters I tried them once but too scared to try again it was an art to be able too step in and out of them. I remember moving into the ADO as it was known in 1959 the year it opened. I was a messenger boy in the Accounts Department which was situated in some huts just inside the north gate prior to its move. I had the cleanest shoes in Billingham compliments of the little wooden boxes in the toilets on the director’s floor. I had great fun going “over the top” in the Paternosters. It was a grand building at the time but it is a great shame that it has got into the state that it is in now. In the mid 1970s I worked for weeks as a “temp” for ICI. Oh boy do I remember the Paternoster lift in ADO My greatest ambition was to stay in it whilst it went “over the top” and “under the bottom”. Well I managed the “over the top” but I just did not dare go underneath. I got out on the topmost floor and had a good view of the area but when it came to going underneath I chickened out. I left after a few weeks and remember reading in the paper how a young girl in another part of the country died whilst “going over the top” in a paternoster lift. They were scary but very enjoyable. This was certainly the Rolls Royce of office blocks in its prime. I remember the grass at the front of the building being as plush as Wembley. We’d have loved to get on there with a football but just going near it prompted a commissionaire to tap you on the shoulder. Researching ICI Nobel”s cordite factory in Dalbeattie (site at http://www.dalbeattie.com/ministryofsupplyfactorydalbeattie/index.html) and trying to establish a Roll of Honour of factory workers and office staff between 1939 and 1945. Do you or any of your contacts know anybody who worked at the Dalbeattie factory ? Workers came from as far north as Wick in Caithness and as far south as High Wycombe. Thank you for your help. I worked in the post room as a messenger girl in Billingham ADO 1971-1972 I think. What a great time and those paternosters were something else. Anyone remember the little red” juve” cards? You got cheap lunches in the canteen with them. Love to hear from some of the girls Louisa Mcmurray and Linda Siddell. I first visited ADO as a messenger boy in 1961. I was amazed at its size and in particular with the length of the corridors, some of which ran the full length of the building. Messengers were not allowed to use the lifts and only senior staff could use the front entrance a policy that continued for many years. But who wanted to use the lifts when there were paternosters. I worked in ADO from 1965 until I moved to Wilton in 1986. I recall a story about a member of staff that had some visitors that asked him what happened when the paternosters changed direction at the ground floor. He promptly offered to show them and stepped in. Once out of sight he managed to stand on his hands and emerged up side down to the horror of his visitors. Bill Tait – Did you repair the audio equipment for the typing services in ADO? I worked there from 1965 to 1975. Loved the paternosters, went “over the top” and “underneath” a few times. We thought we were so brave! Really sad to see the building in it’s present state. I remember the “Juvenile Identity Card” for the reduced price meals in the canteen. I’m ashamed to say mine lasted until I was 20 when one of the canteen ladies noticed that I had grown up a bit and confiscated it. Does anyone know what’s happening to this building? It appears that a builder has recently withdrawn an appeal against a recent planning application refusal to build houses on the site and it is once again awaiting a new developer. Yes, Bill, I did work in 227. The Taperiters must have broken down quite frequently as you were a regular visitor to the office. Still in touch with Carolyn Henson. My husband’s grandfather Gerald McFarlane worked here in the top floor corner office. Not sure if he was the director though. I”ll have to ask him..
My mother Marjorie Cairns was a Nursing Sister in the Medical Department and my father Jimmy Cairns worked in the Laboratories. I worked in A.D.O. as it was called then from 1970 to 1974 first of all on 3rd Floor in the Overseas Dept and then on 7th Floor (Directorate) for Hector McMillan. He was the Assistant Secretary to the Board. David Allen was the Secretary to the Board. It was very quiet on 7th Floor. There was another “floor” above 7th floor which was the Board room only I think. The paternoster lifts were great though the one at the end nearest the cashiers was too slow to use to go all the way up to 7th floor. I occasionally used the other one near the post room jumping on the downward one into the basement on a morning to beat the queue! I’m 23 years old born and breed in Billingham and I’m just starting to find a lot about Billingham reading this was very interesting although what I’m very interested in is the ICI mines I know a bit about them but not enough id like if someone could tell me where abouts the entrance is to them or if they have been destroyed then where they used to be. My mother-in-law also worked at A.D.O. as a wages clerk back in the late 60″s and early 70″s. Her name is Dot Booth and all the girls loved her, she was like the “mom” to them all. She is still doing well, living in Canada aged 83. Is this building still standing and if it is how difficult would it be to go in and take some pictures? PAUL CANNON; THE BUILDING WAS STILL STANDING WHEN WE LEFT THE UK IN JULY THIS YEAR THERE WOULD BE NO CHANCE OF ANYONE BEING ALLOWED INTO THE BUILDING NOW IT WOULD BE TOO DANGEROUS ITS READY TO BE DEMOLISHED. The building was still standing on Thursday 13th December and is fenced off to the public although somebody recently got in and set a fire on the top floor. It’s certainly no longer the icon it once was very much an eyesore but we are informed that negotiations with the owners mean that it should hopefully be demolished by the end of 2008. Paul Cannon – THE end is finally in sight for a fire-ravaged eyesore that has blighted Billingham for years. The process to demolish Billingham House on Belasis Ave in Billingham will start March 2008 and will be completed by Dec 31 the same year. Permission for Photographs if any are to be taken and access should be directed at Watford based Bizzy B who is the present owner. I think it’s so sad on these are going… its beautiful and iconic. All the beautiful things are going like steetly in Hartlepool too. Why are we losing all our industrial master pieces? I worked at Norton Hall in 1944-45. I remember a boy named squib Robertson and another named Alec Wright. The officials there I remember as Dr Fleck and Dr Zeally. The Commisioner was a war vet with one arm. Anyone else worked there then? I worked at the transit shed in the 40s and remember Irene Anderson, Davy Jones (he could sing in chinese) and Bill Jessup. As of friday 8th of august 2008 scaffolding has been put up on the front entrance and workers are in the building getting rid of the mess and knocking in the walls. Is this the beginning of the long end for the office also to Paul cannon. Its very easy to get in as me and mates have ( very silly I know ) but had to before it goes round the back you see a way in. The stairs are still there as of last month but no banister to hold on to the flooded basement comes right up to the first flight of stairs to the ground floor. Some traces of the asbestos can be seen and smelled. The pasternoster lifts have been removed but left open so you can look up and down the shaft. Rubble and broken wall and other rubbish is all over the building and on the top floor there is a skateboarding ramp. Such a shame to see it go in a way. I wonder if the Dr Fleck you remember Alan went on to be the Sir Alexander Fleck who in the 50s/60s held the position of Chairman of ICI UK. If so you worked with an extremely talented chemist who led ICI as a World leading chemical company. My Dad Joseph Kidd joined Synthetic of Ammonia in 1922. I still have the scratty piece of paper recommending him as an employee. Joe as he was known to many eventually became a staff member in employment after showing his worth. I also still have his letters urging supplies from Haverton Hill Goods Station and outlining the difficulties of getting urgent supplies through on time and his suggestions for improvements to assist this. Like many others he was a faithful employee. He was part of a group of people that made ICI into the worldwide famous company that it used to be he also served his country 1939-42 defending Teesside at Sunderland Heavy Anti-Aircraft based at Grangetown. After his retirement in 1951 he kept an interest in the company’s progress through the ICI magazine and the published ICI History Vols 1-2. It is interesting to note from this history that ICI purchased Wilton Castle for the sum of Â£190 000 with 3500 acres of ground in late 1945. Wilton was the home of the de Bulmer families their other old home at Sheriff Hutton Castle is for sale now at Â£1500000 with 11 acres of ground. That sharpens the mind a little. Is this the building that was referred to as ICI Head Office just a little way up from Belasis main factory gate? or was it called Hardwick Hall? If so I went to have a look at it in August 2006 and found it had been demolished. I worked in the Postroom Office in Head Office with Alan Hutchinson Ken Ridley Harry Oliver “Flash” Gordon and a lot of others. The year was 1946. Mr Perryman ran the show assisted by Mr Simpson. I then moved to the “front office” headed by Charlie Hopkins the Commissionaire the one you spoke about having one arm Alan. One of my duties was to light the fire in the board room on the first floor set out the tables and sharpen the pencils. Dr Fleck who you also spoke of Alan was the MD of ICI Limited at the time. When he was in attendance he used to talk to me about what I was going to do with my future. Not bad for a young kid from Billingham talking to the MD of one of the largest companies in the UK. What ever happend to the great ICI? Alan we last spoke to one another about four years ago lost your email address-sorry. It”s a great website this one but not a great deal about the boys and girls from Billingham so come on “youse” lot and give it a go. At one time my mother and father were the longest married couple working for I C I Billingham. My father Norman was time clerk at armmonia plant and my mother Annie worked in the packing sheds. As a messenger boy, I worked at oil works from 1954-55 with Shiela O`Conner, Ann Jones and Brian Burrige. Mr T.N.F. Frankland was the time clerk. I remember Arthur Allen well. We used to sing together with the gang, going to the Carlton at Norton. He was very good at harmonizing. He played the trumpet – remember Lenny Rowbotham and Mo Lambert? Dr Fleck was a no airs and graces super executive. Not answering on behalf of Alan Hutchinson and Alastair (Smith), but yes Dr Fleck did become Sir Alexander Fleck Chairman of ICI Limited. I also believe he eventually became Lord Fleck. I. C. I . A truly world class chemical company with an enormous number of achievements to its credit in so many fields paints pharmaceuticals plastics etc. Now scattered to the winds. These things happen but many of I C I”s former rivals on the world scene are still there still trading under their own names. Makes you think. To borrow an apt phrase Where did it all go wrong Mr (George) Best? I remember vividly one encounter with Dr Fleck or Dr ATS Zeally – can’t remember which. A ripe pear was left on the desk. I was praised because I didn’t steal it! I suppose a ripe pear had a high value then. I can’t remember the paternoster lifts. They look very dangerous – a lawsuit waiting to happen. I would like to know the injury history. I recently managed to get on the roof of this fantastic old building on the 20-08-2008. Inside is a right mess most of the building has fire damage and the lift shafts are open the car park under it is full to the top with water but the view from the top is something else it seems a shame it getting demolished this month. I currently work for one of the companies demolishing the building specifically removing the asbestos and have lots of photographs of its present state. Would love to see any images of it in it’s prime, however as even in the mess it is in now I find it still gives off an air of elegance. I’m sad to see this iconic building in such a state. I worked on a placement on the ICI YTS back in 1984-85 in Management Services working on the computer help desk with Paul Robinson and Brian Ayre. I remember being so proud to walk through the doors of that impressive building and the nerve wracking first use of the paternoster which soon became a game to run past the commissionaire and jump on the “down” side. I installed some of the first PCs and was privileged to be allowed on the 7th floor with its Lowry painting on the walls and plush carpets. I was so impressed I went up for another look after work a cleaner saw me and I was in trouble the next day! I well remember this building I was a messenger lad at Cassel Works 1960-61 and had heard of the Paternoster lifts (tried them once very scary). In general the people I knew who worked there didn’t like them. Drove past last year and sad to see the decline of the building and the apprentice school. I have very good memories of ICI from 1961- 66. There was a great bunch of people working there, excellent apprenticeship which even today is regarded as the best. I’ve just heard on the local radio (BBC TEES) that the council is having talks with a developer for the site. The developer is proposing a refurbishment of the building and making the first 3-4 floors office space. The council Regeneration team were interviewed saying if the redevelopment doesn’t take place then its likely the building will be demolished. I hope the refurbishment takes place – the building could look quite nice again. I started with ICI in the Mailroom in the ADO at 15 years old. My picture was used in a ICI magazine as I walked behind the offices. I started my apprenticeship and a friend, Bob Hodgson and I were riding on his motorbike when we hit a directors Van in the covered over car park. He was crippled and the Van was equipped for that use. He was good enough to let us off which made us both relieved.